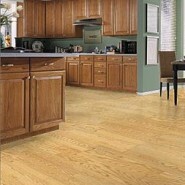 There are several ways for dry cleaning wood laminate floors. One of which is the feature of this article. Vacuuming when cleaning wood laminate floors is a fast and productive way to dry clean the floor. With more and more residences installing wood laminate floors, it is more important now than ever to find ways for dry cleaning wood laminate floors. Wood laminate floors must be treated as a standard wood planning floor and all the same precautions taken on a solid wood floor apply to wood laminate floors. So the least amount of water is the best practice because wood hates water. With this said and as stated above, we are addressing the first step in cleaning wood laminate floors which is dry cleaning or the removal of loose debris such as sand, grit, dust, etc from the floor. Dry cleaning the floor must be preformed prior to wet cleaning the floor. This is true for all floor cleaning regardless of the type of floor that is being cleaned. We have found that vacuuming the wood laminate floor produces excellent results and also achieves another important precaution regarding the cleaning of wood laminate floors which is to minimize scratching of the wood laminate floor. The next section outlines helpful hints to allow our residential readers to improve their overall results when cleaning wood laminate floors and increase the speed it takes to clean the floor. Dry Cleaning and in this case vacuuming the floor should only be performed after high cleaning tasks such as light fixture, vents and air ducts and furniture cleaning has been completed. Otherwise, additional dust and grit will be on the floor after you have already vacuumed the floor. It is important to remove loose soils as often as possible so vacuuming your wood laminate floor will keep sand and grit off the floor which will prevent scratching the wood laminate floor. Avoid running the vacuum over wet or sticky spots on the laminate floor. These will cause a gummy mess and increase the risk of damaging your vacuum. Inspect the floors for attached dirt on the wood laminate floor prior to vacuuming and use a blunt plastic scraper to gently scrape the attached debris such as gum, candy or stickers, etc.